Edit: I see something is happening with the word verification..I do not have it set up on my blog for word verification and I see it is still there. Must be blogger problem? Click publish without entering the word and I think it will except the comment.. 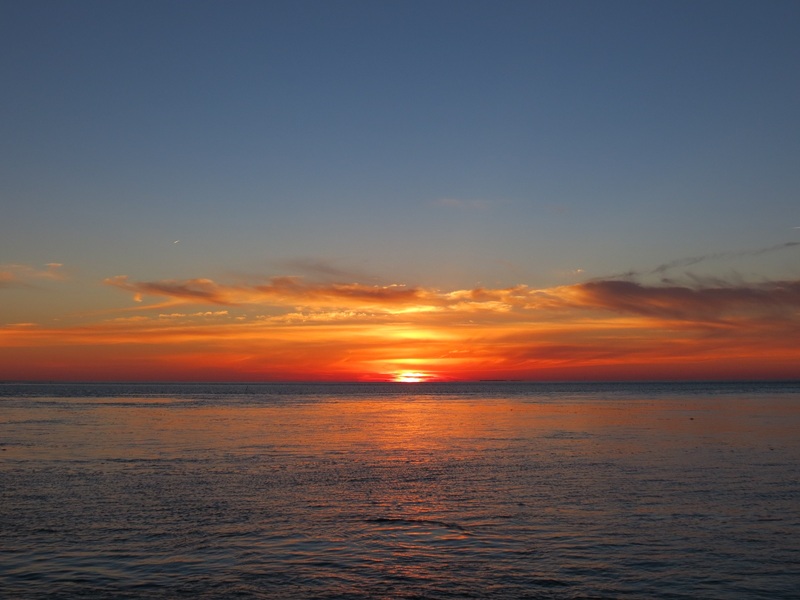 I am sharing some photos from our recent trip to Nags Head in the Outer Banks, North Carolina... These are some sunset shots taken the first evening after our long drive to North Carolina.. We enjoyed seeing the sun setting and a great view of the moon. A Cormorant seen at Pea Island NWR in Nags Head North Carolina..
A group of Brown Pelicans flying over the Atlantic Ocean. Happy Skywatching!! I hope you enjoyed my sunset, moon and bird shots.. I thank everyone for stopping by and for all the nice comments.. Thanks to Sylvia, Yogi and Sandy for hosting Skywatch Friday. I wish everyone a safe and happy long weekend. the lighting in all the shots is fantastic. Love the Moon shot and the Sunset. Have a great weekend. The moon shot is wonderful, and the sunset over the ocean. I love to see pelicans flying by, their outlines remind me of pterodactyls. They all are lovely shots, especially the ones with birds in it.I think theyre difficult to get. Those pretty views were a good reward for a long drive. Nice job, Eileen! Feast for the eyes all of them! woww the moom pic took me breath away. Gorgeous sunset pictures too. Wow! A lovely sunset captured. You take the best moon photos. Great colours in your photos Eileen. 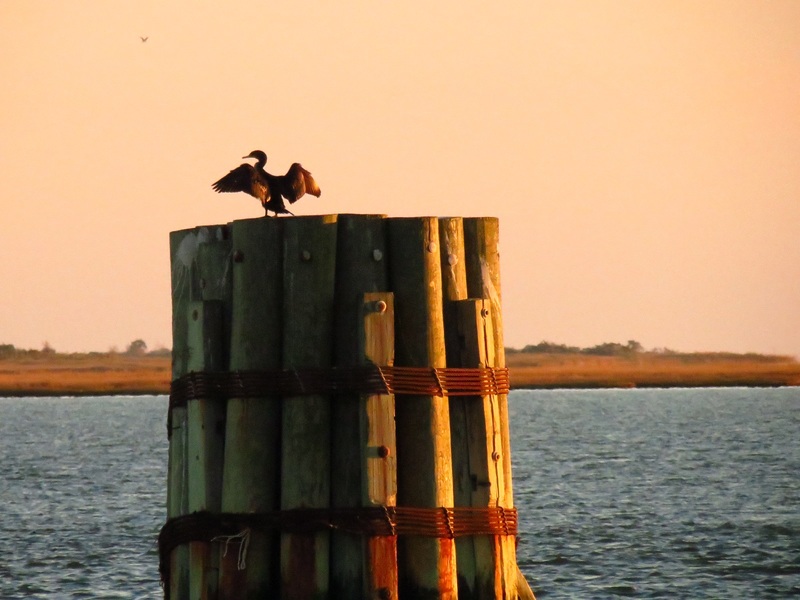 I especially like that cormorant on the post against the setting sun. 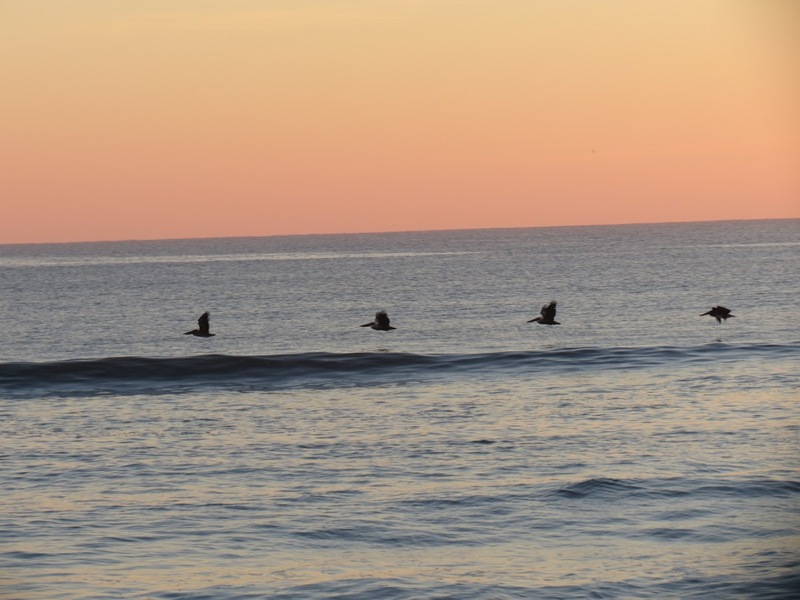 Likewise the line of pelicans - lovely. Have a lovely weekend with lots of birding. Great photos, wonderful and fantastic colors and frames, heaven to dream! A stunning shot of the moon. Happy Friday! Fantastic sky shots Eileen, awesome series. Have a great weekend! Beautiful shots. No favorites. They are all great. Glorious sunset images. They take me far away. Really awesome. Great shot of the cormorant, and beautiful view of the sunset over the water! That last photo makes me a bit homesick for my friend, Joy, and her condo by Monterrey Bay. We used to watch the pelicans fly along the coast there. All great photos! But you always get such spectacular moon shots! love these! just beautiful and peaceful light! WoW Eileen, each image is so beautiful!! The first was my favorite, I love the colors in that one!! Wishing you a wonderful weekend!! Beautiful everything, especially the view of the first picture. Regards. Fantastic moon shot, and great sunsets too. Gorgeous pictures! The first one is spectacular. Now these photos remind me of the time when we lived in Raleigh. We got to the outer banks a few times and loved it! I definitely loved those fantastic sunsets! Have a great weekend! Such a gorgeous set of images! The moon looks so beautiful. Amazing sky shots .. happy Friday, Eileen! Beautiful series of images, Eileen. The sunset I find really quite wonderful. Those are great sunset shots ! Splendid light in that first shot! each one is a beauty Eileen. I did enjoy your sky shots and I wish I had been there to see the pelicans. Beautiful, peaceful images, a sunset to remember. Great post!Wonderful pictures of your trip!I really like the Cormorant,the beautiful sunset and the moon shot!Thank you for sharing! I love the sunsets in the horizon, so pretty! WOW. Beautiful shots. You take the best moon pictures I've ever seen!! All of these photos are gorgeous. Thanks for the beautiful skies. Beautiful sky shots Eileen -- we stayed near there on our east coast trip a few years ago.... such a beautifu coastline. Wonderful sequence of shots from Nags Head. I love visiting there and it's been a while. 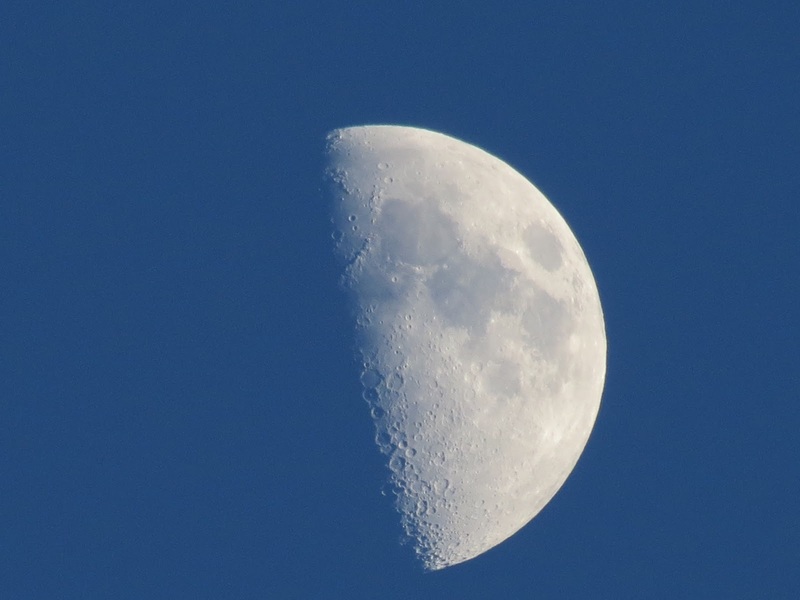 Your moon shot is amazing Eileen! And the colours of the sunset are magnificent! Have a lovely weekend. Wow, these are wonderful ! Stunning moon pic. I tried a few in the last week. But I just can't get my camera to do 'em right. Beautiful pictures...Good that you have the coastline at your disposal. Excellent shot of the moon! And gorgeous sunset! Those are great colors. What a great trip! Stunning photos, Eileen! Stunning photos of a great trip! Sunset on the ocean, superb. Looks like you had a truly wonderful time there. Enjoy your weekend. Jean. I love the sunset photos and the moon is just gorgeous! Great shots, Eileen! 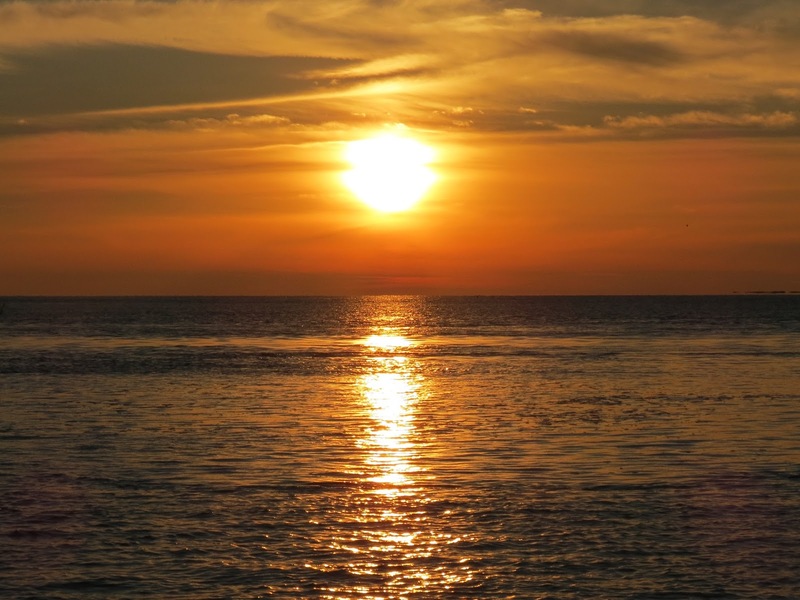 I especially like the first and the two of the sun setting over the ocean - mafnificent! Thanks for visiting! Thank you for sharing your gorgeous skies Eileen, have a great weekend. Haha, how did you get those pelicans to pose like that?!?!?! And the sunsets are STUNNING!